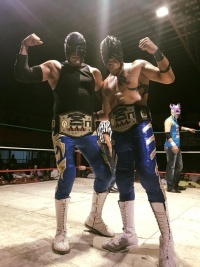 "La Division del Norte" (Kuas Extrem & Snaiper) defeated Dragster & Street Boy, Rio Bravo Jr. & Violento, Dulce Kanela & Larry Miranda Jr. While these titles are named AAA, they are not part of the regular AAA promotion. They're defended for and appeared on shows of Monterrey area AAA promoter Francisco Cantu, most often in Arena Coliseo Monterrey, but sometimes in smaller areas. Championship history is incomplete and may be missing some changes. 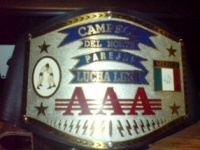 In 2017, the title was brought back by "Promociones Cantu" on Nuevo Laredo, Tamaulipas. This page was last edited on 24 October 2017, at 08:01.